Sean Beaudoin is the author of three cutting-edge young adult novels, including You Killed Wesley Payne. 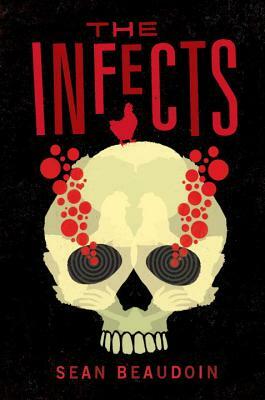 The Infects is his first novel with Candlewick Press. He lives in Seattle, Washington. It is the zombie novel only Beaudoin could write, an allusive horror novel that engages in philosophical, social, and humanist critique while providing plenty of laugh-out-loud moments. Beaudoin’s blackly comedic tale takes zombie lore to new territory—not only with the outbreak’s unusual point of origin but also with its consideration of the next phase of human evolution. An utterly original voice, plenty of sly pop-culture references, and a twist ending make for a satisfying read. This novel is full of dark, satiric humor and irreverent references to punk rock and horror movies. . . . The conclusion of the book is brave and unexpected, offering readers a twist in a bleakly memorable ending. Booktalk this smart skewering of the zombie genre to your older teen readers as a gloriously bloody, profane smash-up of Louis Sachar’s HOLES and the film ZOMBIELAND, and it will find an enthusiastic audience. With sarcastic teens, hundreds of zombies, and an evil villain plotting to take over the world, fans of horror films will enjoy this fast and fun read, especially high school boys! Forget about twists and turns; it takes expectations and turns them upside down and sideways and I loved every moment of the weird, scary, funny, terrifying trip.